This is a prescription-only product which requires a medical license on file. This product can only be shipped to your primary address. 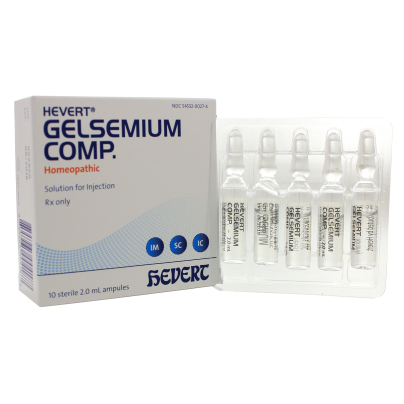 Hevert Gelsemium Comp. is a homeopathic solution for injection. This homeopathic medicine is for human use and RX only. For the improvement of painful nerve conditions, such as postherpetic neuralgia, trigeminal neuralgia, or sciatic nerve pain. Hevert Gelsemium Comp. may be administered intramuscularly, subcutaneously or intracutaneously. “X” indicates a homeopathic dilution.